If someone were to ask what was the advantage of elaborating the indications and promises of different bhavas in such a detailed way as S. Ganesh has done in this book? the answers will be many. The same planetary placement and combination with its variegated meanings, is susceptible of positive and negative meaning, depressing sometimes and uplifting others times. To be able to do it, interpretative skill should be developed and no conclusion clinching formulae should be collected because astrology is art and science, mathematics and interpretation. This book will answer a need. Primarily, American and western readers will feel that they have now armed themselves with lot of predictive firepower which their own astrology never provides. It is only the Hindu astrology that is predictive - prodigiously, precariously and even prevaricating. Inherent in predictions are motivations and actions which is why Hindu astrology, without claiming or pretending to be psychological, is superbly psychological as western astrology never can be. The great merit of this book is that it is illustrative and interpretative where navamsha too has been used. The book had to become very bulky unavoidably. 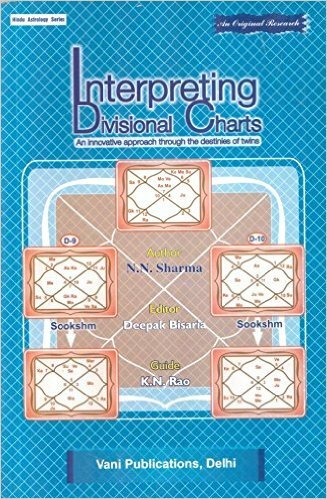 In seeing the illustrations given in this book always look at the navamsha also to understand the scheme of interpretation. It is because a uniform approach is followed in trying to standardize an interpretative method. This book is very brilliant, very stimulating. It is a sumptuous meal that will whet the appetites of many and help some hard working astrologer with a gift for synthesis to become a brilliant predictor. If you miss that you will people your world with ghosts and fears, instead of learning astrology properly, you will be gripped with fear psychosis. It should be kept in the mind that astrology offers an insight into the meaning and purpose of life and its predictable pattern of events and destiny. Shri S.Ganesh is one of the most revered and respected names in Vedic Astrology.Practising this science for more than 25 years now,Shri S.Ganesh is also teaching Jyotish at Bhartiya Vidya since 1994.Brought up in traditional South Indian Hindu family,his father Shri A.R.Sankara Narayana was secretary of Madrasi Vedic Brahmin Association.He has spiritual roots traced to revered Sringeri Mutt and His Holiness Jagadguru Sri Sri Shankaracharya is his guru.